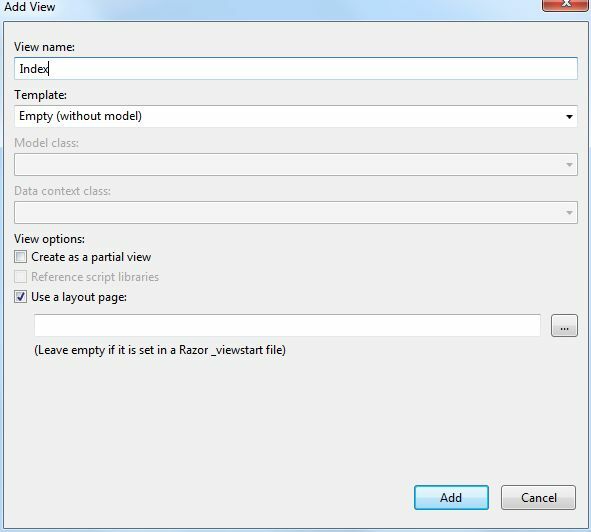 This article represents a new step-by-step guide on how to create a simple yet elegant Google-like calendar/scheduler in ASP.NET MVC3/MVC4 Razor (C#). 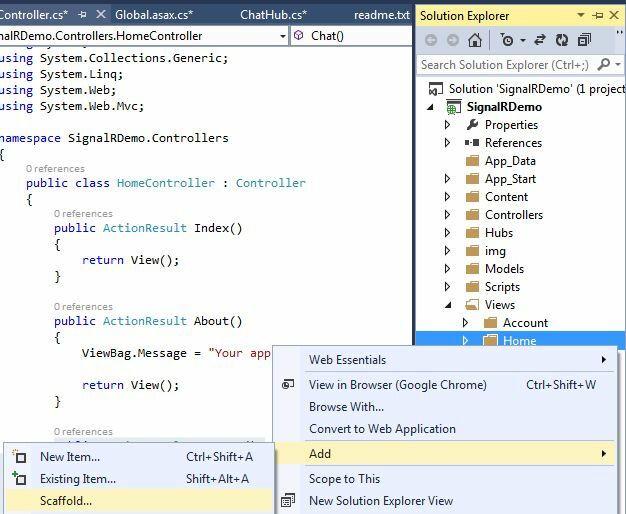 Create a new project in Visual Studio by selecting ASP.NET MVC 3/ MVC4 Web Application from the list. The project template should be empty. The view engine is Razor by default. We will create a simple scheduler in C#. The next step is to set up a database. Right-click on ‘Your_project_name’ (e.g. 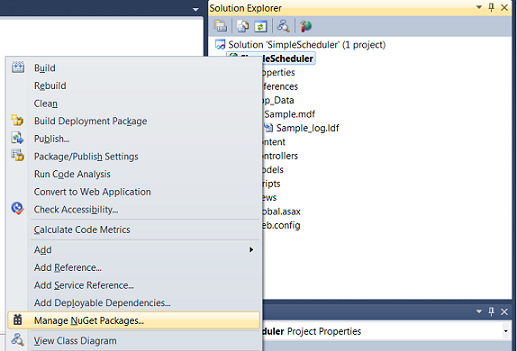 SimpleScheduler) -> Add -> Add ASP.NET Folder -> App_Data -> Add New Item and name it “Sample.mdf”. 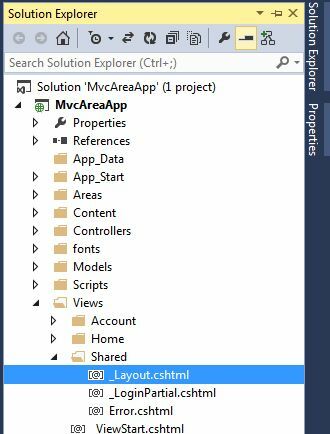 Note: for ASP.NET MVC4 project the folder App_Data is created automatically. /Models/CalendarEvent.cs -- a sample model that can be deleted. The installed MVC3 Sample also contains a sample class model. You don’t need it and can delete it. 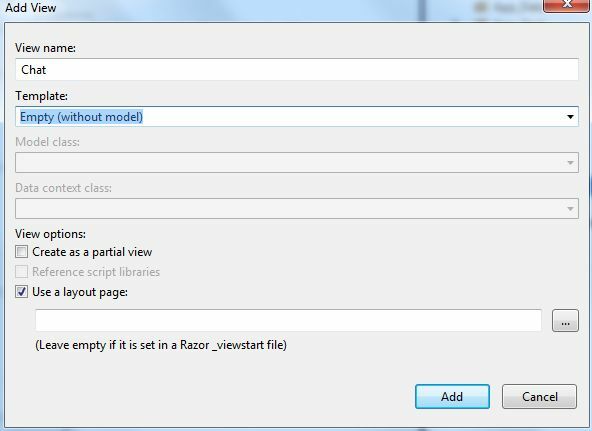 To create a new model right-click on the folder Models -> Add New Item. 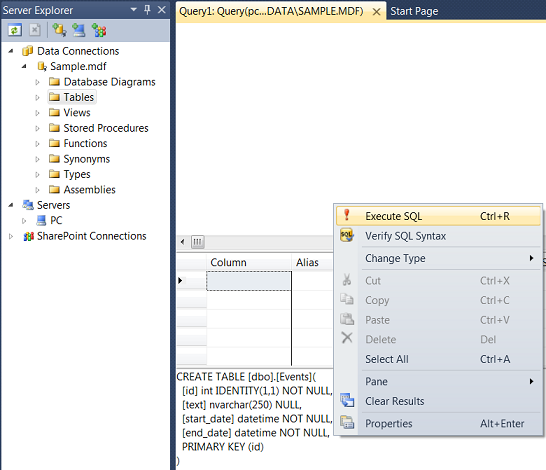 In the new opened window choose LINQ to SQL Classes and name it Sample.dbml. 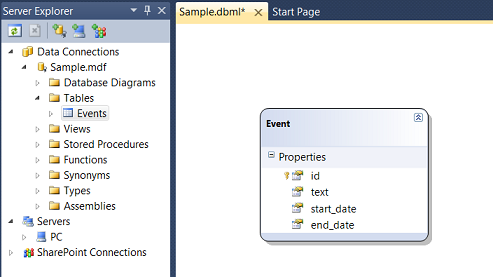 Double click it to open a visual editor and drag the Event table from the Server Explorer to the Editor. Let’s update the methods in the CalendarController.cs to connect the controller with the newly created Model. First we need to load data from the Model. We have changed the Model class used in the method. We’ve also added the required methods from LINQ to SQL and a helper that updates all object properties in the data base (except for the id). That’s it! 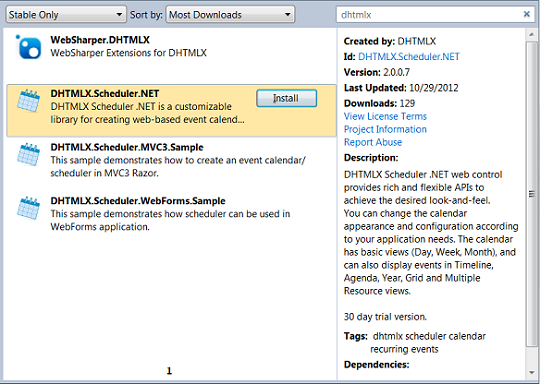 The scheduler for ASP.NET MVC3/MVC4 Razor is ready to use. In this quick article, I will tell you the problem that filter overrides is trying to solve(with an example). I will also show you a quick fix of a bug that I found in ASP.NET MVC 5 regarding filter overrides. The hack is simply creating a new OverrideAuthorizeAttribute inheriting from AuthorizeAttribute and implementing IOverrideFilter interface and then applying this to the Index action method. If you have started developing web applications with ASP .NET MVC 5 you might have noticed that it comes with bootstrap version 2 and the latest version 3. In order to upgrade the default template for version 3, you can use these files as a reference. 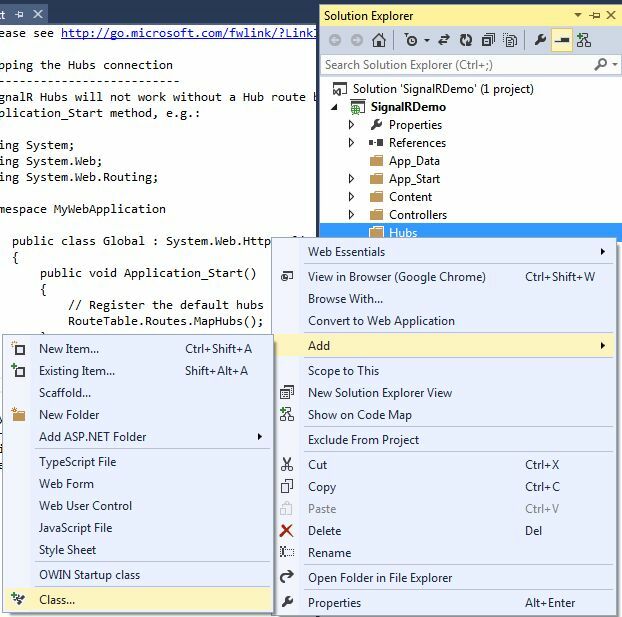 In this article I am using the ASP.NET SignalR library in the latest MVC 5 project template. Now, what is this real-time functionality? It is used to access the server code and push the content to the connected clients instantly instead of the server waiting for the client's request. Visual Studio 2010 SP1 or Visual Studio 2012. Step 1: Open Visual Studio 2013 and create a New Project. 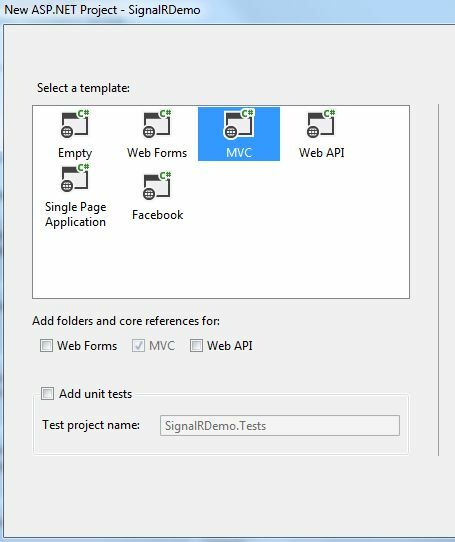 Step 2: Select MVC project template. Step 3: Open the Package Manager Console. 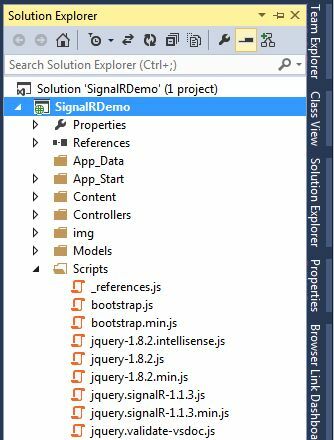 Step 4: You can see in your Solution Explorer that the SignalR was successfully added to your application. Step 5: Add a new folder named Hubs in your application and add a class in it. ViewBag.Message = "Your contact page." Save all your application and debug the application. Use the following procedure. Step 4: Copy the browser URL and open more browsers, paste the URL in the address bar and do the same thing as above. MVC (Model, View, Controller) is a design pattern to separate the data logic from the business and presentation logic. We can also design the structure physically, where we can keap the logic in the controllers and views to exemplify the relationships. It is also possible that we can have large projects that use MVC, then we need to split the application into smaller units called areas that isolate the larger MVC application into smaller functional groupings. A MVC application could contain several MVC structures (areas). How to creating a simple application for defining the area in MVC 5. MVC 5 is the latest version of MVC used in Visual Studio 2013? 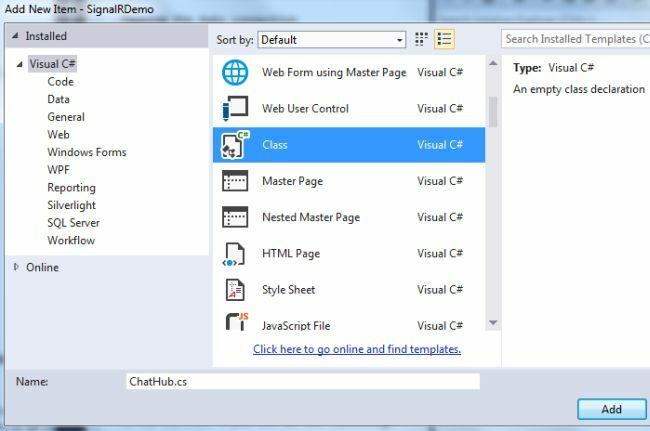 Use the following procedure to create a Web application based on a MVC 5 template. Step 1: Open Visual Studio 2013. 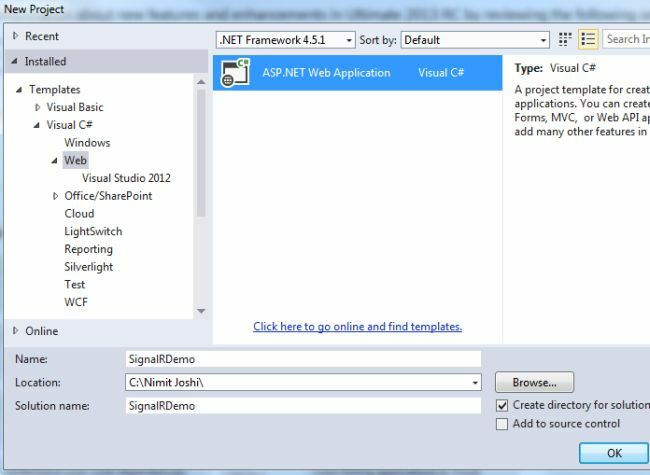 Step 2: Create an ASP.NET Web Application with MVC 5 project template. Step 4: Enter the name for the area, such as "News". Step 5: Similarly add an another area named "Article". Now from the steps above you have added two areas for your application named News and Article. We have successfully added an area, now we'll add controllers for each of our areas using the following procedure. Step 1: Right-click on the Controller in your Article area to add a controller. Step 2: Select "MVC 5 Empty Controller". Step 3: Enter the name as "ArticleController" . Step 4: Similarly add the controller for "News". We have successfully added a controller for our area, now to add a view for the area using the following procedure. Step 1: Right-click on the "News" folder in the View to add a View for the News Area. Step 2: Enter the view name as defined in the NewsController. Step 5: Generate some content for the Article view. Step 1: Open the "Global.asax" file. Step 1: Open the project view Layout file. Step 3: Debug the application, and finish! In this post we will cover a few tips and tricks to improve ASP.NET MVC Application Performance. While working on this site, I have tried to improve page loading speeds as much as possible. There are a lot of tricks that you can do to improve the speed of your site. I have constantly been learning new things by delving into the world of site performance.